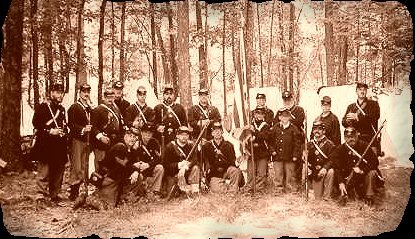 The 15th MVI Reenactment Troop at Gettysburg 1998. For living history purposes we all portray soldiers from different companies --usually someone from their own home town. In re-enactments we portray one company agreed upon beforehand. During living history, we set up a camp and display what artifacts, both reproduction and authentic, that we have. This tends to stimulate questions and encourage discussion with the public. We do this on a town common or park in conjunction with some local event. For re-enactments we travel to a site, mostly in the north-east. When we arrive on Friday evening, we set up camp and drop out of the 20th century until Sunday afternoon. During that time we sleep in dog tents, cook over an open fire, conduct company and battalion drill, go out on skirmishes, and on Saturday and Sunday afternoon we take part in a full scale battle -- many times not only with infantry, but including cavalry and artillery as well. For myself, the first two years of re-enacting I enjoyed the full scale re-enactments best because of what I learned, but I now prefer doing living history more because it allows me to share what I have learned with the public.